As is always the case with stories like this one today, there are several levels of things going on. There is obviously the true narrative which actually occurred. Along with that, there are moral lessons which can be derived from the text which are always good for life application sermons. There are also pictorial representations of other things – normally pointing directly to Christ, and often adding in other aspects of redemptive history. And tied in with that third is a fourth, prophetic, aspect of the stories. There are things which are prophesied in Scripture which are seen in mere shadows, which are then spoken forth as future events by later prophets, and which will be realized at various points of time in redemptive history. This account is no different. We’ll look at some of each of those details today. One of them stands out as an obvious tenet though right from the surface of the narrative. Moses is said to have married an Ethiopian, and it says that Miriam and Aaron spoke against Moses because of her. Although it’s not always plainly evident in Scripture because of rather hard words against certain people groups, one of the things which the Bible teaches is that all people are on the same level before the Lord when it comes to salvation. No person is exempt, and no one is favored over another. That isn’t always evident in churches too but it is explicit in Scripture, regardless of how the preacher or teacher attempts to manipulate the text to say otherwise. God made all men from one man, one blood, and God has placed all men in the exact spot where they would be most likely to call out to Him and be saved. What this means is that the guy in Mongolia in AD1227 would be no more likely to seek out the Lord than he would have been if he was born in Sarasota in 1964. He has placed us all in a spot where the hope is that we will seek Him. Miriam and Aaron didn’t like that their brother married an Ethiopian. That is what the surface text says, and so we can see that they were what we would today call racists. That will be explained as we go on. But that racist attitude is actually hiding a more deep-seated type of contempt in them. We will see that as we go on as well. Sometimes, negative attitudes against people, or peoples, come from places we may not even know exist. We shut out the deeper animosities and express our hatred of someone or something in order to divert the attention away from something that others might find even more offensive. And if not others, certainly the Lord. A quick example would be hatred of the Jews. There are lots of reasons people say they hate the Jews. A couple days before I typed this sermon, some loser shot up a synagogue and killed eleven Jews because he said they were behind all kinds of crazy conspiracies. Jews get blamed for a lot of conspiracies, but that is usually not the reason for people hating them. First, they remain isolated as a culture, and secondly, they tend to be extremely successful in whatever they do. Combine the two, and you have a recipe for real jealousy. No matter what the Jews do, they always seem to do it a bit better than the next guy. And because they collectively seem to excel as well, the world hates it. They can’t figure out the secret to their success, and so they blame them for … all types of crazy conspiracies. “Those Jews get ahead, but it can’t be because they have earned it. Therefore, they are cheating.” In the end, I would say the majority of Jew hatred is simply that – jealousy. It has festered since their inception, and it continues today. Whatever other reason for hating them, the main reason is found in jealousy. It’s the human condition. That may have seemed like a pointless diversion, but it’s not. Jealousy is a green-eyed monster, and it is found not against only the Jews, but it is found in the Jews as well. Their jealousies are just directed in other ways. We might see a picture of that in our verses today. Maybe so. One thing is for sure, great things are to be found in His superior word. And so let’s turn to that precious word once again and… May God speak to us through His word today and may His glorious name ever be praised. va’te-daber miryam v’aharon – “and she started speaking – Miriam and Aaron.” There is an immediate stress on the misdeeds of Miriam here. First, the words, “then spoke” are in the feminine in the Hebrew, highlighting Miriam’s role. Further, Miriam is mentioned before Aaron. It is apparent from this, as it was from the account of the golden calf, that Aaron is a rather weak and indecisive figure. Miriam is the one who has taken offense, and she grabbed Aaron by the hand and led him into the sin of speaking against Moses. This is all the more certain based on the outcome of the events where she alone is punished with leprosy. Despite this, Aaron is not innocent. First, because he didn’t immediately attempt to put out the fire that Miriam had started, and secondly, because in his not doing so he only urged the matter on further. This now becomes the greatest threat of all of those which had come, or would come, against Moses. Though seemingly not so, at all other times, Aaron has stood, or will stand, with Moses. But this is an insurrection which comes from within Moses’ own house, and from his two older siblings. It could presumably be a point where the two outvote the one. But more so, if this rebellion were to advance, it would compromise the entire structure of order which had been developed for the people on their trek to Canaan. And further, Miriam was called a “prophetess” in Exodus 15:20. Though that is probably not an office, but rather a description of what occurred in relation to the song she had sung, she may have felt over-confident of her station because of the title. The fact that this comes after the granting of the Spirit that had rested on Moses to seventy others is not to be missed. Miriam was probably incensed that she did not receive any such favor, nor did Aaron. In this, they appear to be jealously responding to having not received something to which they had no right. The meaning of this is highly debated. The Hebrew word is kushi, the same word used to describe an Ethiopian. Some say this is speaking of Zipporah because of the location of Midian, where she was from, was actually once a part of land belonging to Cush. Some think Zipporah had died and Moses married another wife who was an Ethiopian. Or, it could be that Moses took a second wife who was from Ethiopia. The details don’t matter, other than to say that this is not Zipporah. That will be evident in a minute. Cush, or Ethiopia, was a descendant of Ham, the son of Noah who had done something perverse to his father. His brothers included Mizraim, or Egypt of today, Put, who became some of the troublesome North African peoples, and Canaan, the son of Ham who was directly cursed by Noah. It is evident that Miriam felt superior to this woman and despised the fact that Moses had married down the social ladder. That was a strong rebuke to Israel that they were no better than the supposedly lesser peoples who surrounded them. Miriam will be imparted this same knowledge indirectly through what occurs. 1 (con’t) for he had married an Ethiopian woman. 2 So they said, “Has the Lord indeed spoken only through Moses? 2 (con’t) And the Lord heard it. Here is an ominous statement. It is true that the Lord hears all things, but at times He chooses to not hear some things. This complaint may have simply been between Miriam and Aaron. Regardless of the scope of those to whom the words were conveyed, the Lord heard and chose to hear. Here is a new word in Scripture, anav. It can signify humble, meek, depressed in mind or circumstances, afflicted, and so on. It comes from the verb which means to be humbled or afflicted. The context drives the meaning, and here the context appears to be different than translations state. I say “appears” because I first held to one view, and then came to another. The preceding chapter spoke of Moses’ affliction because of the ingratitude of the people towards both him and towards God. No man had endured such responsibility, leading to affliction, that he had. This is confirmed in his words when he appealed to the Lord. He had carried the pains and burdens of the people as if his own. It was he who found the very authority and power that he possessed as oppressive, and yet it was his own sister and brother who envied that same authority. They assumed that they could carry the burden as well as he could, but they had not been endowed with the Spirit which had rested upon him. 4 Suddenly the Lord said to Moses, Aaron, and Miriam, “Come out, you three, to the tabernacle of meeting!” So the three came out. Well, here you have it, the Lord spoke directly to the three of them. It doesn’t say that He spoke to Moses who then relayed that on to the two others. They knew the Lord’s voice, and they responded to it accordingly. The word “suddenly” was introduced in verse 6:9 when speaking of a person dying suddenly next to a Nazirite, thus violating their vow of consecration. In other words, there is a sudden, abrupt, and unusual call out to them. One can sense the displeasure and the foreboding of disaster in the use of the word. The same terminology was used in verse 11:25 where the Lord is said to have come “down in the cloud” to speak with Moses and impart the Spirit to the seventy elders. Further, the Lord is at the door of the tent, and therefore they are outside, not inside of it. 5 (con’t) and called Aaron and Miriam. And they both went forward. The Lord’s voice obviously issued from the cloud, calling them to stand before Him. They would have passed the altar of offering on their way there. This is problematic, because Miriam has come forward bearing the sin of presumption, she has brought no offering, and she has had no sacrifice for her sin. She is in the presence of the Lord, but without the required atonement. What is being said here is that the revelation communicated to Moses is on a completely different level than that of any of the other prophets of the Lord. How this is so is yet to be explained. 7 (con’t) He is faithful in all My house. Here is a new word, khidah, or that which is enigmatic, or a riddle. That comes from khud meaning “to propound a riddle.” All other prophets during the period of this covenant would receive revelation in an obscure manner, whereas Moses received his in an open and fully understandable way. This doesn’t mean that Moses knew all the pictures and patterns which the words he penned contained, but that the words themselves were not a curiosity or enigma as to why they were being received. 8 (con’t) And he sees the form of the Lord. The word “form” is the same word translated as “likeness” in the Ten Commandments when speaking of the likeness of anything in heaven, on earth, or in the water under the earth. Moses saw a likeness of the Lord which no other saw. Quite possibly he saw the physical manifestation of the Lord that the apostles later saw, and touched, and walked with. They knew these things, they had seen Moses ascend the mountain to meet with the Lord. They had seen him go to the tent outside the camp to meet with the Lord, they had seen him enter the tent of meeting daily to meet with the Lord, and they knew that the words he received there would come true as spoken for the people’s benefit, such as in the giving of manna. And yet, they spoke presumptuously against him. In this, it was not Moses that they actually spoke against, but the Lord Himself who spoke to them through Moses. v’yikhar aph Yehovah bam va’yelek – “And burned nostrils Yehovah against them, and departed.” The Lord’s fury, as described by burning nostrils, raised up. In this, the Judge determined His sentence, and without allowing them to even respond, He departed as if from the bench of judgment. 10 And when the cloud departed from above the tabernacle, suddenly Miriam became leprous, as white as snow. 10 (con’t) Then Aaron turned toward Miriam, and there she was, a leper. It is speculated why only Miriam was punished. That is not valid speculation. Aaron indeed received punishment. Miriam was the instigator of this, and yet Aaron did nothing to restrain her, showing his weak and malleable character. The punishment upon her would be a torturous punishment to him because of his failure to man up to the situation before it got out of hand. Secondly, he could not even reach out to comfort her without becoming unclean and violating his office. And thirdly, simply because of his office, he was spared the leprosy – an implicit rebuke to him came because of the office which necessitated his not being afflicted despite deserving it. 11 So Aaron said to Moses, “Oh, my lord! Please do not lay this sin on us, in which we have done foolishly and in which we have sinned. Aaron’s words here show that the punishment inflicted on Miriam is a punishment upon him as well. He acknowledges his guilt, he acknowledges his sin, and he acknowledges his punishment – all united with that of Miriam – alenu, “on us.” Further, this is the second recorded time that Aaron calls his younger brother adoni, or “my lord.” The first was at the incident of the golden calf when he was clearly in the wrong. Now he again calls Moses “my lord.” His acknowledgment of Moses’ authority is once again highlighted. This is the ceremonial aspect of leprosy. Though alive, the afflicted one is treated as dead. He is cut off from the congregation, and can have no contact with them. Thus, all lepers are also separated from fellowship with the Lord at His sanctuary. The words in the Hebrew are in a most passionate form where Moses repeats himself – el na repha na lah – “God I pray, heal I pray, her.” The use of el, or God, signifies His mighty power. The word comes from ayil, or ram. Such an animal is the symbol of strength as it butts with its horns. Moses’ use of it here acknowledges His power, and petitions for Him to use it once again, for good and not for destruction. 14 Then the Lord said to Moses, “If her father had but spit in her face, would she not be shamed seven days? The idea of one spitting in another’s face has not changed in our society from that of the Hebrews. It was an act of great contempt. It is seen in Job where the young men who once revered him now contemptuously would spit in his face. Further, it is referred to in Isaiah 50 when prophesying of those who would spit in the face of Christ. That prophecy is fulfilled in the words of Mark 14:65. For a father to spit in his daughter’s face, the Lord says that she would be kalam, or ashamed, for seven days. It is a new word signifying being humiliated or insulted. If such was the case with a mere spit in the face by a close relative, how much more shamed should Miriam be when the Lord has afflicted her with the due penalty for her contempt of Him! According to Leviticus 13, a person who was confirmed to have leprosy was to be put outside the camp. Once that was healed they were to be checked again and if cleansed, certain rituals were to be conducted and they would be allowed into the camp, but not into their tent for another seven days. Whether the leprosy was healed by the Lord immediately, but the penalty for defilement caused her to be kept outside the camp, or whether she was not healed until the seventh day, either way, she bore the disgrace of having become unclean through the leprosy. It is obvious that any defiled people traveled with Israel, but not in the ranks of Israel. There would have been defiled people at any given time during their travels. Therefore, there must be more to this verse than merely waiting for her to be brought in again, as if it was necessary for the camp to move. Such wouldn’t be the case. Rather, it is the fact that they actually waited for her to be brought in again that is of note. The entire camp was made aware of the reason for their delay. Miriam had offended the Lord, and she was being punished for it. First, the entire camp would know that she was reduced to a leper and disgraced. And second, the entire camp would share in the punishment of Aaron and Miriam as a warning to never oppose Moses in such a manner again. The word for bringing her back into the camp is asaph, or gather. Until they gathered her in, the camp would not move on. *16 And afterward the people moved from Hazeroth and camped in the Wilderness of Paran. As noted in Chapter 11, Khazeroth means Villages. Paran means “Glorious.” Only after Miriam was asaph, or gathered in were the people ready to move into the wildness of Paran. What we have in this passage today is a snapshot of what would happen to Israel after their rejection of the Lord. Moses here is typical of Christ. He has married an Ethiopian wife. In this case, it doesn’t matter if this is Zipporah or not. Moses has taken a Gentile as his spouse and brought her into his tent. It is the Lord’s sovereign act of grace that He has included Gentiles in His covenant graces. Miriam here pictures the prophetic witness of Israel, and Aaron the priestly witness of Israel, both of which testified to the Person and work of Christ, but which Israel collectively has rejected. In other words, their jealousy of Moses is reflective of Israel’s jealousy of what was understood from their own law and the words of the prophets. But what is more is that, as noted, their hatred of the wife was merely a pretext for hatred of the fact that they did not receive the portion of the Spirit that the elders of Israel did previously. Both Christ and the apostles were hated because of their witness of the work of the Lord and the acceptance of a Gentile bride. Israel saw the mysteries of God’s workings being revealed to the Gentiles through the apostles, and they hated that. They were jealous of it, and they fought against it. This is all revealed in the New Testament, much of it in Acts. 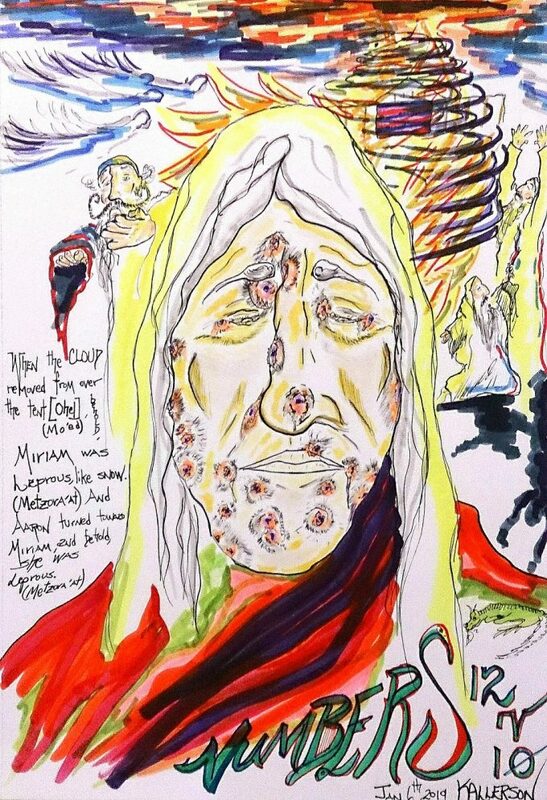 The plague on Miriam is the curse upon Israel which happened because of the stand against Christ. However, Aaron the high priest begged Moses for relief and healing. This is just as Jesus called out, “Father, forgive them, Father, for they do not know what they do.” In this, Christ, the true High Priest, petitions for the healing of Israel. But a time of punishment must first be fulfilled. The seven days of Miriam’s punishment is reflective of the words of Leviticus 26 where the Lord said He would punish Israel seven times for their sins if they didn’t heed Him the first time. Israel didn’t heed after exile to Babylon, they rejected Christ, and their second punishment is for seven times. Israel didn’t move on again for seven days until Miriam was gathered in again. And only after their extended second punishment of seven times over would Israel, the people, be gathered in. That has actually happened in our lives, and they are almost ready to move on. As far as the location here, it is Khazeroth, or Villages. It implies a place of many villages, and thus many people. It is a fitting description of the land of Israel’s exile around the world among many settlements and a wide range of peoples. The people remained there until Miriam was gathered in. It is the same word, asaph, which speaks of the people of Israel having been gathered again into the land of Israel in the latter days. In type and picture, we are seeing a simple snapshot of what occurred after Christ’s ministry as was revealed in the previous chapter. Israel didn’t want the manna, Christ. They lusted after other flesh which only brought death. They saw the witness of the seventy who prophesied. They came against their Prophet like Moses. They received their punishment, being defiled and unclean ceremonially, and in a state of corruption and death during their period of banishment. But they were eventually restored and gathered in again. They are heading into the Wilderness of Paran, or Glorious. If that doesn’t sound like the attitude of the nation as displayed towards Christ, I’m not sure what else would do better. They rejected Him and His apostles, they looked to glorify themselves through the law rather than through Christ, and they have done their best to hide the Author of those gifts. The patterns from Numbers look to the reality of the world in which we, even this very day, continue to live in. The Lord has you exactly where He wants you. He has a good plan and purpose for you. It may seem at times as if you are lost in a desert, wandering aimlessly. But the Lord is there, carefully leading you to the Land of Promise. So follow Him and trust Him and He will do marvelous things for you and through you. So they said, “Has the Lord indeed spoken only through Moses? When he comes out of his mother’s womb! And is ready even then to be entombed! Would she not be shamed seven days?